Shopping list apps for the iPhone and iPod touch can save time at the grocery store (and we all need to do that, right?). Instead of using pen and paper, grocery list apps offer built-in databases so you can quickly add items to your list. The best apps also include barcode scanners, coupons, and the ability to share tasks with your family members. 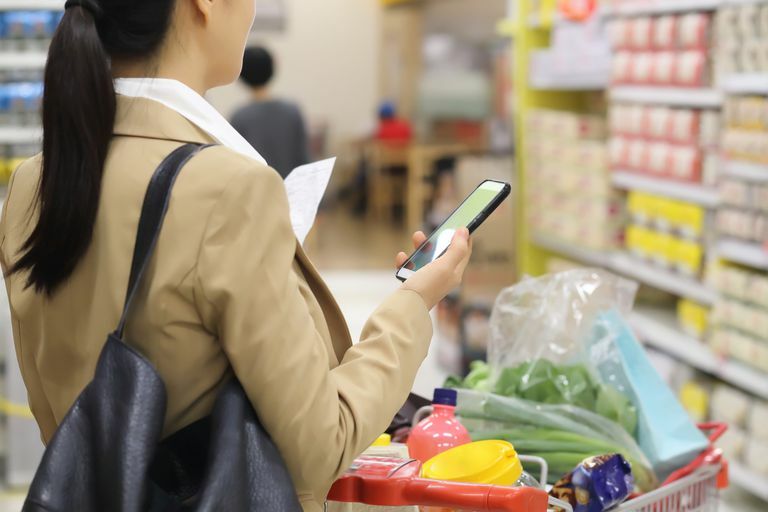 If you want to transform your trips to the grocery store, these apps can help. Populates grocery list with all the ingredients of a chosen recipe. Sleek interface with pro-quality photos. Optional membership needed to remove ads. Only three free scans included with free version of app. BigOven isn't strictly a grocery list app. Instead, it's an app that integrates recipes, menu planning, grocery lists, and meal suggestions. The app offers over 350,000 recipes for all sorts of occasions and from all kinds of cuisines. You can save a recipe and, with one touch, add all the ingredients from it to your shopping list, sorted alphabetically and by a section of the supermarket. A $20 per year pro membership lets you upload unlimited recipes, store recipes in custom folders, remove ads, and more. Easy to organize lists for different stores. Syncs across multiple Apple devices and Amazon Echo. Groups products by aisles and color codes. The sharing feature requires an in-app purchase. Buy Me a Pie! focuses on letting you simply and efficiently create shopping lists. Pick from its built-in database or add your own items and then group similar items with color coding for easy shopping. The app makes it easy to create multiple lists and to share lists via email or text message. If you sign up for an account, you can share lists with other users and automatically see changes to lists from all users. In-app purchases (monthly, annual, or lifetime options) let you have up to 20 lists, share with up to 20 people, and remove ads from the app. Everyone in the family can view and edit the grocery list. Intrusive advertising in free version. Doesn't sync with Apple Watch. Grocery items don't group by category automatically. Another app that's not solely focused on grocery lists, Cozi Family Organizer is designed to be a single hub around which you can organize your family's life. It offers a shared family calendar to keep everyone on the same schedule, to-do lists in which tasks can be assigned to different people, and a recipe box. It's easy to add items to the shopping list and a paid upgrade feature provides an easy-to-use checklist for when you're at the store. The $30/year Cozi Gold subscription removes ads and lets you track contacts and birthdays, among other features. Add all the ingredients from a recipe to the shopping list with one click. Categorizes shopping list items by type automatically. Grocery list feature is a small part of this expansive app. Intrusive banner ads in free version of app. Like BigOven, Epicurious is primarily a recipe app, but one that adds integrated grocery list features to make your meal planning and shopping simpler. Packed with over 30,000 recipes from magazines such as Gourmet and Bon Appetit, and publishers like Random House, the app updates its recipes with the change of the seasons and to prepare you for holidays. A hands-free mode lets you focus on cooking while still getting directions, and a cook timer for the iPhone makes sure you don't leave that casserole in the oven for too long. Fun to tap icons for familiar food items to add them to the list. Remembers previous week's list to help with new list. Matches items in weekly ads and coupons with items on shopping list. No diary or notes section to record prices. No way to be notified when a product's price dips below a set price. Forget clipping coupons. Flipp can aggregate flyers from over 800 retail stores, associate coupons with the items you add to your grocery list, and help you save money on the things you need to buy. Use the app to view the latest flyers from stores near you, find coupons to either print or use digitally, and create a shopping list. Tapping each item in your shopping list brings up coupons and offers from stores near you to help you save the most. Flipp can even notify you when the coupons you've saved are going to expire soon and when you're near a store whose coupons you've saved. Includes two lists: shopping and pantry. Comprehensive list of categories for adding items to shopping list. Scans URLs of pantry items for inventory list. No way to match coupons to items on the shopping list automatically. Free Shopping List Ease lets you create two kinds of lists: what you need to buy at the store and what you have in your cabinets. That's pretty handy if you buy the same thing two shopping trips in a row because you forgot you bought the item last week (hi black peppercorns). You can add items to your list by typing them in or by scanning barcodes. Sharing lists with family members allow you to see when they're buying items so you don't buy them, too. The app also lets you browse and print coupons. A $30/year subscription removes ads, gives you unlimited lists and custom categories, and upgrades the app for everyone in your household. Scans barcodes and provides a quick search to add items. Saves photos of items to aid in locating the item in store. Not updated to run with the most current iPhones. Grocery Gadget aims to help you create lists for more than just groceries: the pharmacy, office supply store, errands, and recipes. You can add items to your list by typing or by scanning barcodes and then sync that list with friends or family members to share the shopping. Save money with coupons and by comparing the price of an item on your list at multiple nearby stores. You can also edit your list online using Grocery Gadget’s online portal. Database contains hundreds of thousands of items. List accepts voice entries and URL scans. Syncs with other family members' phones. Interface is a little confusing. Hasn't been updated in more than two years. Need to print out coupons and take them to store in most cases. Grocery iQ is one of the most full-featured grocery list apps for the iPhone. With it, you can create lists by typing in your items, scanning barcodes, or using voice search. Clip and print coupons and have coupons show up based on the items you add to your list. Even cooler, if you create a Grocery iQ account, you can sync it with your store's loyalty card and add coupons directly to that and skip printing entirely. You can use the app's website to create and update your lists, and sync your list with other users. Calculates the total spending amount of the list. Syncs with other iOS devices. Type in the app is tiny and hard to read. Shopping List isn’t as feature-rich as some other grocery apps, but it covers all the basics. You can create multiple lists, sort items into categories for easier in-store shopping, calculate the projected total cost of a list, and more. You can't share your lists with other users from within the app, but lists can be emailed and lists can sync to the same app on other iOS devices. Useful for a range of activities in addition to shopping lists. Syncs with team or family members' devices. Better suited to team use than individual use. Can't sort by more than one label at a time. If you know Trello — a task-management tool often used in web development or programming — it may be a surprise addition to this list. But with its very simple interface and terrific collaboration features, it will be just the thing for some users. With Trello, you make boards that contain lists, and lists contain items. A single board could contain shopping lists for different stores, for instance. You then invite people to collaborate on your boards, assign items and dates to them, and more. With its drag-and-drop interface and versions for mobile devices and the web, Trello can make organizing your shopping easy. Can add notes and comments to shopping lists. Syncs between iPhone, tablet and computer. Apple Watch app was discontinued. Like Trello, Wunderlist is more of a task manager than a dedicated grocery list app, but if you want a single app that contains all of your to-dos, including shopping for food, it could be a good option for you. With it, you can create multiple lists, assign due dates, set reminders, and assign tasks to other users. The $50/year Wunderlist Pro subscription service lifts limits on the number of times you can assign tasks in a single list, how many subtasks you can create, and offers new personalization options for the look of the app.